Six graduated cups, dozens of possibilities for bath and play time. 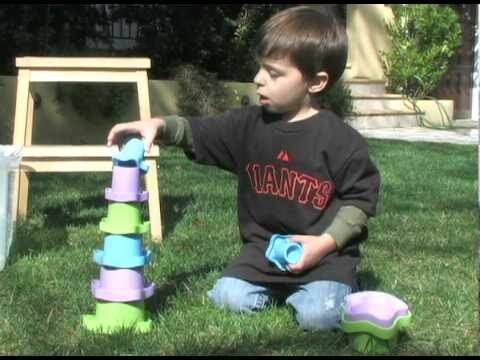 Scoop and pour water, build towers by turning upside down, or just sort sizes to nest. The My First Green Toys™ Stacking Cups are colorful and fun, and teach basic counting and math concepts. Each cup is numbered on the bottom from 1 to 6 and is volumetrically accurate. Fill cups 1 and 2, for example, and it will equal the volume of cup 3. Perfect for home, classroom, outdoors, or the tub. Color combinations may vary.